Whenever we buy a new piece of technology, we have to weigh the decision carefully. With a phone it isn't simply a case of picking the device with the biggest screen or the fastest processor; there's a more fundamental decision: iPhone or Android? Whichever you choose will lock you into that device's ecosystem for the next couple of years – and your choice of apps and features will be limited by the side you pick. And with today's cars becoming increasingly tech-filled, from sat navs and entertainment systems to what are essentially in-car operating systems, considerations of compatibility, obsolescence – and yes, Apple vs Android – are now just as important when you're buying a new set of wheels. We don't replace our cars as often as we replace our phones, or even our games consoles. According to one report, most American consumers now plan to hold on to their car for 10 years before trading it in. When we buy car, then, we're essentially gambling that the features and functions on offer will still be useful in maybe a decade's time – and given the pace at which technology evolves, there's a real risk that we could end up lumbered with the automotive equivalent of a Betamax or HD-DVD player, long after they've become obsolete. So what to do? Here's our guide to future-proofing your car to make sure you're asking for the right things... or that you're at least able to upgrade when the time comes. Car manufacturers and smartphone makers know that in the future we're going to expect a lot more from both our vehicles and our phones – and Apple and Google have done something really smart. Apple has created CarPlay, while Google is offering Android Auto. The idea with both is that you plug your phone into your car, and a screen on your dashboard will give you access to car-friendly versions of the apps on your phone – Google Maps, Spotify or whatever. All of the processing takes place on your phone, with the screen on the dash being simply an easily accessible window to the data you need. This means that over the next decade, as your phone gets faster and smarter your car will too, without needing to replace your vehicle. So in 2026, when you're plugging in your iPhone 11 or Galaxy S15, you'll still be able to run the latest apps, even if you're driving a 2017 Ford Fiesta. So the advice here is simple: make sure your next car supports CarPlay and Android Auto, and your car's entertainment system will easily be able to keep pace with your phone. At the time of writing, over 100 different cars support CarPlay, and a similar number support Android Auto. If you want to upgrade your current car, Pioneer make a number of aftermarket devices which you can plug into certain head units. 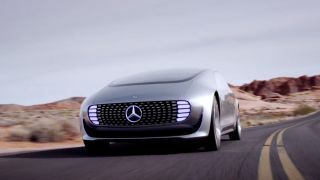 If you try to imagine the day you buy a driverless car, you probably see some distant time in the future when you hand over the keys to your boring old conventional car, and pick up a fully autonomous vehicle that looks like something out of the Jetsons. It turns out, however, that the autonomous revolution won't be like that – and in fact, you may already own your first driverless car. Thanks to the power of connected vehicle technology, car makers are able to issue regular software updates that add new functionality to vehicles already on the road. Most famously this happened with Tesla, which introduced 'Autopilot' mode as an over-the-air update for existing Model S owners. This added features that enabled the car to steer itself when it can detect lines demarcating the sides of the road, and adaptive cruise control to ensure that you maintain a safe distance from the car in front of you. It even added a 'summon' mode, which enables owners to press a button on an app and have the car drive up to them over short distances. Tesla isn't unique, and there are a number of these 'semi-autonomous' cars, including the BMW 750i and the Mercedes-Benz S65 AMG. So it seems inevitable that over the next decade we're going to see more autonomous features. In fact, Tesla CEO Elon Musk has publicly speculated that we could see fully autonomous vehicles on the road as early as 2017, and that by 2018 Teslas will be driving coast to coast in the United States autonomously (we'll believe it when we see it). What this means for you is that if you're buying a new car now, your best bet is to buy one that's semi-autonomous or one that's at least connected, and able to receive updates, so that when carmakers do bring the technology to market you'll be best placed to receive the software enhancements. From April 2018, all cars sold in the European Union will be required to support eCall, a system that will automatically transmit data if anything goes wrong. Essentially, the system will automatically contact the emergency services over a voice connection, as well as transmit a 'minimum set of data', which includes the vehicle's location, so that emergency services can reach you faster. At the moment no specific models have been named as the first to feature the new standard, though the European Commission has voted for all cars created from April 2018 to be eCall compliant. In the meantime, or if you don't want to upgrade your car and still want the benefits of eCall technology, Bosch has created a Retrofit eCall plug, which plugs into the 12V socket on your dashboard and connects to your phone via bluetooth. This does the same thing, and if its accelerometers detect a crash it will automatically call for help and transmit your location (pricing and availability has not yet been announced). When it comes to the aftermath of a crash, it is now increasingly common to find dashcams built into cars, rather than as simply an accessory that can be removed. For example, the New Citroen C3 comes with what the company calls a "ConnectedCAM" built into the nub where the rearview mirror attaches to the roof. This records your journeys on 16GB of built in storage, automatically switches on if it detects an accident and will record for 90 seconds. The significance here is that dashcams are not just useful, but soon they could become essential either by law or by the requirements of insurers. The latter is already starting to happen with larger insurance firms like AXA and Confused.com offering discounts to drivers that have dashcams installed. It is conceivable that as the technology becomes trivially affordable and more ubiquitous that it could be made a requirement. So if you want to be fully future-proofed, make sure your car has a camera - or can easily have one installed without becoming a hulking great lump on the dashboard. We're a society that is mad enough to let people attempt to pilot large chunks of metal moving at high speed, so wouldn't it be great if those chunks of metal could talk to each other and make us much safer? That's the rationale for the steps being taken towards Vehicle to Vehicle (V2V) communication systems. Following successful trials in 2012, the expectation is that V2V could become a requirement on all new vehicles in the not too distant future - with both American and European regulators attempting to allocate the 5.9MHz frequency band solely for communications of this kind. The idea is that if everyone has the connection, your car will have a better idea about what potential hazards are on the road ahead, as indicator and brake signals can be sent wirelessly to your car's computer - limiting the need to rely on your hazy vision. Similarly, if there is an incident further along the road but your view is blocked by a large truck, the V2V system could transmit that information back to your car so it knows to slow down or get out of the way. Though a number of major companies are currently working on it, no cars yet have come with the technology built in - though General Motors has apparently said that the 2017 Cadillac will come with V2V. Once it arrives, given the potential safety benefits it is inevitable that, just as with the eCall system, V2V will likely be required in all new vehicles - original plans were for this to be mandatory in the US by 2017, but it looks like that deadline won't be met. It's accepted that the future of automotive travel will involve some kind of electric propulsion, but we don't know yet is how soon the future will arrive, and how it will look. There are signs, however, that mainstream use of electric cars could be here sooner than we think though - and this could have profound implication for combustion engines. Perhaps the strongest sign so far is the "affordable" Tesla Model 3, which is due for launch at the end of 2017. Despite not much being known about the car, 373,000 reserved one by May 2016, signalling that soon the 720,000 pure EVs currently in use will soon be joined by many more. The upshot of this is that the "chicken and egg" problem of needing charging stations could soon be solved, as the economics of building plugs will soon make rapid expansion worthwhile. Juniper Research reckons that this reduction in "range anxiety", combined with improved battery life and greater public awareness could lead to 17 million hybrid and electric vehicles hitting the road by 2020. What does this mean for your next car? If you go for a gas guzzler not only are you killing the planet, but you could be hit in the wallet too. As soon EVs become more viable, governments will want to incentivize their use - so will bump up the road taxes and fuel duty on polluting cars. With major cities facing air quality problems, it is also likely that in the next decade we'll start to see cities ban the use of CO2-emitting vehicles. In fact, Paris has already started. As of 1 July 2016, cars registered before 1997 are banned from the city between 8am and 8pm on weekdays, and these regulations are only set to tighten. So if you want to actually be able to drive your car whenever you want in the future - get one that runs on electricity, at least partly. Wireless charging is becoming increasingly standard in phones - with the likes of the Samsung Galaxy S7 and LG G5 supporting the technology. It seems inevitable that over the next few years Apple will add wireless charging to the iPhone. So when buying next car, don't condemn yourself to spending the next decade untangling wires - choose a car that supports wireless charging. According to one study by Juniper Research, by 2020 50 million cars will have built-in wireless charging - up from around 4 million now. And given that both Apple and Google is working on making their car systems work wirelessly, soon you may just have to sit your phone on the dash or in a cup holder to give it some juice and connect it up. Wireless charging could also enable some cool new features in future cars - such as "Cockpit Drill" customisation. By using the phone to identify the driver, your car could adjust the driving seat position automatically for each driver, meaning no more faffing about trying to adjust the headrest before you set off. The only complication as things currently standard is that there are two different wireless charging standards: Qi and A4WP/PMA… and it isn't inconceivable that when Apple gets around to adding the feature it will go its own way and invent its own standard. But if you do want to take a gamble, Audi, General Motors (Vauxhall), and Toyota have all started making cars with wireless charging included - and currently, Qi is the frontrunner to be the widely accepted choice. And finally, if you truly want to remain future-proof, perhaps the best option is to not buy a car at all. With the rise of services like Uber, it is conceivable that eventually private car ownership could become a thing of the past. Why go to the expense of owning a lump of metal if 99% of the time it remains unused? Why go to the hassle of finding a parking space? Wouldn't it be easier if you can simply be dropped off right outside where you need to be? If you live in a large city like London or New York, this sort of lifestyle is basically already possible. Simply hit a button on your phone and a car will turn up - and you'll be soon on your way to your destination. As technology improves this is only going to get easier too. When vehicles become fully autonomous too, it will be bad news for taxi drivers, but the cost of rides will go down as the likes of Lyft, Uber and rivals won't have to pay for a driver, and will be able to keep its vehicles running 24/7. Elon Musk writes that he plans for Tesla to let drivers rent their cars out in the future while they're not in use, letting them become self-driving options for the rest of us - meaning you'll always have access to your own private chauffeur. At a certain point, once you've factored in tax, insurance, repayments and fuel… that seems like a lot of hassle. Perhaps it is time to embrace the future and pick up not a new car, but your phone?